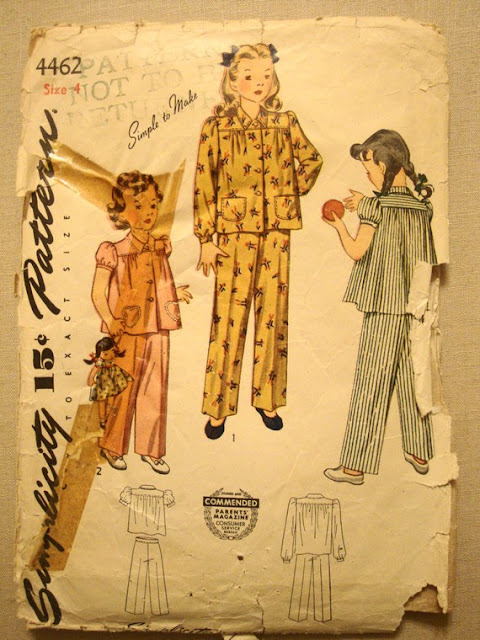 Little V wanted button front pyjamas and I wanted to test my skill at a true vintage pattern. I found this one from the 1940s on Etsy. I had read descriptions of really old patterns on the internet - apparently the pattern pieces were printed on plain tissue without any writing. Ack! I uncorked some wine and tried to guess which mangled piece was which. They were so ahem, old, they were like perforated kleenex. I wasn't sure how badly I was going to screw up the project, so I tested it on a vintage sheet. The pants were a cinch. Pants haven't evolved much over time. The top was an adventure in guesswork. Modern patterns have markings printed on them where you are meant to gather, add darts or match seams. Old patterns just have a series of punched holes. I just gave up and winged the collar which is why it looks nothing like it's supposed to. Let me divert your attention to the more successful button front. Because all V really wanted was buttons. They look great! You're braver than I could ever be... I wouldn't know what to do with those pattern pieces! I think they turned out really cute! I'm not sure I could have figured out the pattern. I'm used to all of the markings, but in the vintage pattern's defense, I think even the modern patterns are a lot like perforated kleenex. LOL It certainly doesn't take much for me to accidentally mangle one that's for sure. So cute! I struggle with modern patterns so big well done on the vintage ones!! I love the fabric you chose for this pattern. Very pretty. Stunningly beautiful. The sheeting fabric works a treat with such a gorgeous pattern. You've done really well. I love 'em! What a challenge, but you did it with penance! When I come across a pattern that is very wrinkled, I iron it on a low setting. I've also been known to lightly spray it with spray starch to stiffen it up a bit. Love the fabric from the vintage sheet so pretty. I'm sure V is a very happy little girl. Also, you are one brave woman, I took one look at those pieces in your photo and I would have used them for wrapping paper and just drank the wine. These are SO sweet! Make me a pair too?? They totally remind me of my grandmother, thankyou!